Dr. Andrea’s wellness center is right on the border of Aventura and North Miami Beach on Biscayne Blvd. If you’re looking for a holistic minded wellness center and you live or work in the area this is the place for you. It is conveniently located behind the Olive Garden restaurant in the medical plaza. It is a beautifully designed office that boasts a salt therapy room, meditation room, massage and acupuncture rooms. Dr. Andrea uses acupuncture and Chinese medicine to focus on a number of chronic and acute conditions such as pain issues (back, neck, shoulder, knee, etc. ), women’s issues (infertility, irregular or painful menstruation, symptoms of menopause, etc. ), autoimmune conditions, digestive disorders, pediatric conditions and more. She has years of western medical experience prior to her training in acupuncture and holistic medicine. As a pediatric nurse and then director of nursing at Fertility and Genetics in Plantation Florida, she gained a plethora of knowledge that she blends with her training in eastern medicine. It is the perfect combination when you can find a practitioner that can understand your disorder from a western medical perspective, but treat the disorder with a holistic minded eastern method such as acupuncture. Please peruse this website as we have provided you with a lot of information to educate potential patients on our services, our approach, and our compassion to help and heal people with the wonderful and powerful tools of Chinese medicine. 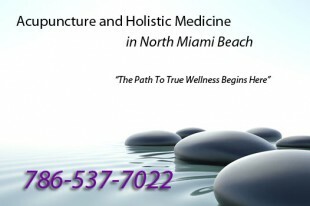 Acupuncture in North Miami Beach – Call us at 786-537-7022 if you have any questions regarding treatment, insurance, or any other query you may have. We hope to meet with you soon!